Radjabov had questioned Grischuk replacing Carlsen in an interview given to Chess-News back in November, after Radjabov finished second in the World Blitz Championship in Moscow. The point was simply that FIDE’s own regulations said that if a player (in this case Carlsen) withdrew after a certain date then his opponent (Radjabov) should advance directly to the second round. At the time of the earlier interview Radjabov was also reluctant to comment on Carlsen’s withdrawal for the simple reason that it still wasn’t too late for the Norwegian player to change his mind. We now know that Carlsen’s withdrawal is final, and all the other players have signed their contracts. In today’s interview Radjabov, apart from the key announcement that he won’t engage FIDE in a battle, also expresses backing for Carlsen’s decision to withdraw, and gives an interesting explanation of why his own rating hasn’t been higher in recent years. Did the past year stand out in any way for you? What’s stuck in your memory? In sporting terms it went very well for me. Based on my results in the FIDE Grand Prix series 2008-2010, in which I was always among the leaders, I made it into the eight candidates for the World Chess Championship, and that’s a title I hope to fight for. As well as that in the World Blitz Championship, which included all the strongest super-grandmasters, I was only half a point from winning the title – I had to make do with second place and a silver medal, which can be considered a good achievement in itself. Sticking to the Candidates Matches, you said that you intended to take some sort of action in connection to Alexander Grischuk replacing Magnus Carlsen. Are you still intending to do that or will you prepare for your new opponent, Vladimir Kramnik? I have nothing but respect for Grandmasters Magnus Carlsen and Alexander Grischuk. I’ve known them for many years and we have a good relationship, which I hope will be maintained in future. The approach of certain FIDE officials to this professional question struck me as a little amateurish. However, the silence and agreement of all the championship cycle participants to the endless changes in the regulations for the Candidates Matches prompted me to stick to the principle that “one’s as good as none” [lit. “alone on a battlefield you’re not a soldier”]. Therefore I didn’t take on the role of a chess Don Quixote, tilting at windmills. What’s your opinion on the decision of Magnus Carlsen, your former opponent, to leave the World Championship Cycle proposed by FIDE? I think that Magnus Carlsen was absolutely right to act as he did. He’s number one on the world rankings, he’s won a large number of super-tournaments (often with a big gap over second place), so he has the image of the strongest chess player in the world. The FIDE regulations mean that he’d have to expose his image to great risk, playing only four-game matches against strong opponents, paired off not according to the actual strength of the players at the current moment in time. In such four-game matches the element of chance is dramatically increased. I think it would be fairer to hold a double round-robin Candidates Tournament, in which the randomness of the result would be reduced to a minimum. 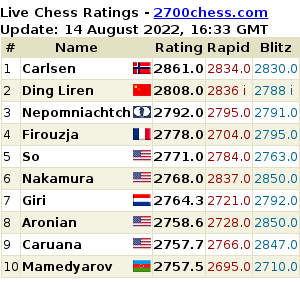 I think Carlsen would play in such a Candidates Tournament. If we take it that your opponent in the Candidates Matches will be Vladimir Kramnik, something which everything points to, despite it not yet having been officially declared, how would you characterise the current Kramnik? In particular, he’s begun to take more risks lately. In your view is that a real attempt to change his tactics, or a smokescreen on the eve of the Candidates Matches? Well, it’s already 99% clear that my opponent will be the Russian Grandmaster Vladimir Kramnik. I prepared for Magnus Carlsen, and now I’ll have to prepare for Kramnik. I wouldn’t be surprised if there were more changes and they gave me another opponent. I’m not planning on any special study of the style of my opponent or on determining his strong and weak points. As the eleventh world champion, Robert Fischer, said: “I don’t believe in psychology. I believe in good moves”. I’m of the same opinion. Will you play in any tournaments before the Candidates Matches or are you going to prepare for them exclusively? Are you planning on holding training camps anywhere else, perhaps in Kazan itself? I haven’t yet decided on that. I’m putting together the schedule of tournaments and training camps now. You’ve been considered one of strongest grandmasters in the world for many years now. You’ve won a large number of medals and titles. You’ve been the 4th and 5th best chess player in the world and been in the top 10. Are you capable of topping the world chess ratings? Of course that’s my goal, but in recent years it hasn’t been so easy to dramatically increase my rating. The thing is that when I’ve played for Azerbaijan and for club teams I’ve had the black pieces in a majority of those games, in the interests of the team. Playing as Black against strong grandmasters means more intense preparation and a reduction in the chance of winning. My opening repertoire with Black isn’t based on calm equalising systems, but on complicated and risky forced variations aimed at seizing the initiative. All of that demands great expenditure of energy. Look at how many games I’ve played with Black in team events in the last three years, and how many I’ve played with White. The ratio’s about 3 to 1. I think a considerable number of top grandmasters would have suffered heavy rating losses if they’d played so many games with Black. Besides, I don’t consider ratings an absolute indicator of strength. In my opinion chess ratings are less important than the World Championship title, the number of super-tournaments won, the number of wins against super-grandmasters, and so on. Another indicator of a player’s strength, of course, is consistently being in the top 10, the top 5 or the top 3 in the world rankings. At the moment, however, we’re witnessing a high degree of rotation in the world top 10. A sportsman briefly makes the top 10, but then only a month later he’s down to the top 30 and someone else takes his place. So the correlation between the true strength of a player and his live rating is now quite blurred. That’s how I understand ratings. Many average chess fans, and tournament organisers, are in thrall to the magic of ratings [smiles]. Finally, allow me to take this opportunity to wish all your readers the very best for the New Year! Radjabov’s statement (“I sacrificed Elo for the best of my country”) sounds good for a home crowd but doesn’t really stand scrutiny: Over the last three years, in team events he had 20 whites and 31 blacks, and lost in total 3.2 Elo points. 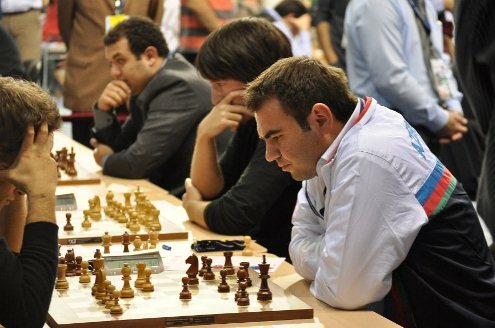 Excess blacks are due to three events in 2010 where he actually gained 3 Elo points – the Azerbaijani strategy to give Mamedyarov as many whites as possible is fairly recent. He fell out of the top10 primarily due to bad results (minus scores) in Linares and Nanjing 2009. I suppose he could claim that he’d have picked up rating points in the 2010 team events if he’d had an equal number of whites? But yes, I wasn’t sure that statement would live up to much scrutiny! 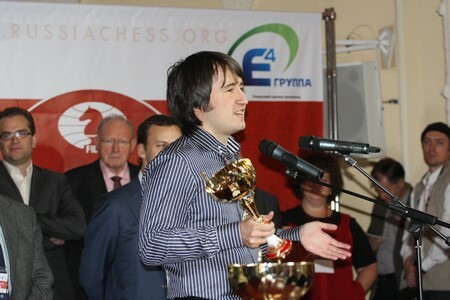 One thing I didn’t add to the article in the end was the part that this Black/White thing had to play in the incident which started the whole saga of Gashimov being left out of the Olympiad (which I covered here: http://www.chessintranslation.com/2010/09/gashimov-left-out-of-azerbaijan-team-for-olympiad/ & here: http://www.chessintranslation.com/2010/10/update-on-the-gashimov-saga/ ). In September 2009 Radjabov was top 8 for the seventh list in a row, but in 2010 he was never better than 10th, and he did have 15 team games with black but only 6 with white last year. Counting from the last rounds of the European Team Championship 2009 Radjabov has 17 blacks and 6 whites in his 23 latest team games, so in this period (but not earlier) it has more or less been a 3 to 1 ratio. With a Karjakin schedule instead (12 white games and 4 black in his two latest team events) he may have had a few points more on the rating list, but he hasn’t played as well as expected in some events. After being rather stable around 2750 the last four years he needs to show that he can close in on 2800 and not get stuck just outside the top 10. Even if stable 2750 is quite good too. Such numbers can always be tuned to one’s need: if you also make it three team events and 23 games for Karjakin, you end up with 14 whites and 9 blacks (he had excess black games at the Russian Club Cup Premier League in April 2010). There is another reason why Radjabov’s implicit claim (“I’d have picked up rating points if only I had more whites in team events”) has little substance: According to statistics on the FIDE rating pages, he scored 58% with white (+26=92-7) vs. 55% with black (+33=86-19) – roughly extrapolating this to his 23 games in 2010 team events, he might have scored 14/23 rather than 13.5/23 with a more even color distribution, a difference of maybe 2 or 3 rating points!? And while he may not remember earlier team events, he should have a general idea about his overall results with either color … . Compare this to a few other players: Mamedyarov W65%, B55%, Karjakin W66%, B52%, Kramnik W68%, B47%. A quick scan suggests that Nakamura may be the only other world top player who scores equally well with both colors, but his impressive results (W71%, B69%) include comparatively many games against weaker opposition – statistics include games since October 2007 when he still played many Swiss opens. About Karjakin: As I said before (elsewhere), his rating gain doesn’t just come from the Olympiad, but also from finishing shared first in three consecutive round robin events (Poikovsky, Tal Memorial, Russian Championship) … . Thanks for the interview. Is the phrase “alone on a battlefield you’re not a soldier” a Russian proverb? I rather like it. He claims that this is especially difficult with his enterprising style of opening. He implicitly claims he did quite an impressive job of scoring with Black with risky play against top opposition. That’s true. If he spends the same amount of time and energy to develop a Winning-with-White repertoire, he could end up with a higher rating. That’s speculation, of course, but plausible. And if he spends more time on “calm equalising systems” with Black, he might get even further. That’s my opinion. I hadn’t seen it before, Mathijs, but yes, it seems to be a Russian proverb! It could also be “warrior” instead of soldier. @Bartleby: Fair enough, I agree with you – also that this is quite speculative. It almost sounds like “if only I was Kramnik, I would have a higher rating”!? I picked Kramnik not just because he does have a higher rating and I like him as a player, but because he might be the other extreme: monster with white, often just equalizer/neutralizer with black. 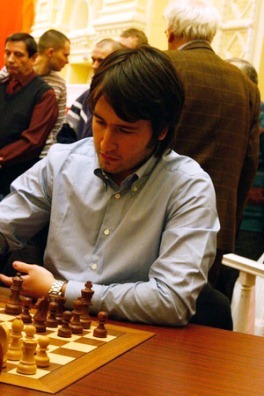 Fact is that Radjabov plays sharp risky lines with black with good results. Fact is also that his white repertoire is rather tame, take his score on the white side of the Scotch: +1=22 including five draws in less than 20 moves (not the Scotch is tame, but the lines he chooses which often include an early queen swap). – His excess blacks in team events are consequence rather than cause of this pattern. Maybe not even because he scores slightly better with black than others, but because he is less efficient with white? The first, but not the second point may be a chicken and egg issue!? Maybe his Elo would improve if he changes his attitude to opening preparation, his repertoire and/or his style. But that’s easier said than done, and color imbalance in team events certainly isn’t the main reason.